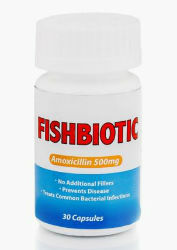 A full line of Pharmaceutical grade antibiotics intended to treat a wide range of bacterial infections in fish. Use for Gil Rot, Columnaris, Dropsy, Infected Eyes, Skin Ulcerations, and Gil Disease. Safe for marine and freshwater aquariums. Available in: Amoxicillin 500 mg, Ampicillin 250 mg, Cephalexin 250 mg, Ciprofloxacin 250 mg, and Penicillin 250 mg.